During the Autumn of 2011 I began to produce Flash Applications (swf files) for my pupils to use as examples of what they could make in ICT lessons. As many of them had applicatios for primary teachers I uploaded them to the TES site, together with links to pages that explained hwo the teachers could make them themselves. 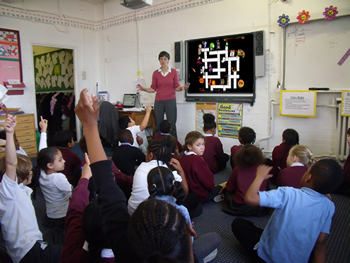 I was very 'chuffed' at the response I had from primary school teachers who had used my applications within lessons, but some had difficulty in finding all of the applications I had made and so I decided to publish the resources I had made on my site. The TES site is useful for showcasing new resources, but once a resource is published the site does not offer a very good service for showcasing similar resources from an author so that a teacher can view other resources by that author that are on a similar theme. I have sorted the resources into type and calendar theme that will allow you to view the full range of assets I have made - either by theme or type of resource. The navigation bar along the top of the page allows you to easily skip between types and themes. There is also a means to return to the main Cybercomputing site should you wish to make use of the tutorials that teach you how to create such projects for yourself. The 'contact' part of the menu allows you to e-mail me and/or select to follow me on Twitter or the Blogger site. The names for these are under Cyberphysics - but that is my main site and therefore I view all correspondance via that site's name. I hope you find this additional section to my site useful.